WARNING: Not for the literary faint of heart! Welcome all word nerds and novel geeks! 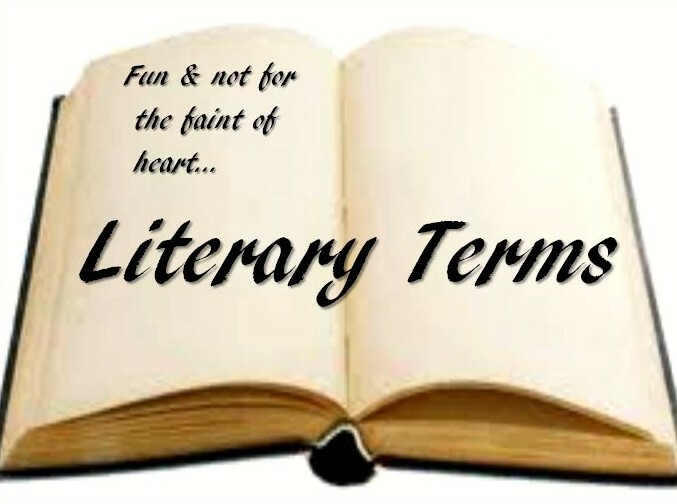 For the more mundane terms, take a blog-quick jaunt through A Few Literature Terms. For die hard bibliophiles, bibliomaniacs, literati,or clerisy enjoy the brief tour through Literary Land. Aesthetics: Philosophy of art, studying the nature of beauty in literature. Allegory: Literature/poetry in which every character, setting, and event is a metaphor or represents something else. Contains a moral, religious, political, social, or satirical message. Anachronism: Object, custom, person, thing, or event that is totally out of its natural place in time. Aphorism: Truism or maxim about some aspect of life or the human experience. Apostrophe: Summoning or crying out for a person who is dead, absent, or imaginary. Bowdlerize: Removing immoral, indecent or pornographic words or passages from a piece of writing. Censorship. Cacophony: Harsh, grating loud sounds with the constants b, d, g, k, t. Used in poetry but also an effective authorial technique in dialog or to describe a discordancy. Computational stylistics: Analysis of aspects of author’s style that are measurable. Prepositional phrases, multi-syllabic words, and syntax ( sentence length) can be found in many editing computer programs. Deux ex machina: Latin for “god from the machine.” American for “You gotta be kidding me!” You might remember this phrase from your high school days. It describes any contrived or artificial rescue or solution to get characters out of trouble or danger. Melodrama employs this…and many movies. A long lost spinster aunt saves the farm. A tree falls in front of a the bad guy as he chases the good guy. In the movie The Adjustment Bureau—plot spoiler—God (the Chairman) allows the couple to stay together. Explication de texte: Detailed analysis and very close reading of a passage or text. A thorough examination of style, syntax, tone, symbolism, and diction is done to achieve a greater understanding and appreciation for the author’s work. And, by the way, it’s what I teach. Fun stuff! 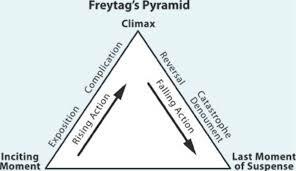 Freytag’s pyramid: The structure of a 5-act tragedy. Gestalt: The whole is greater than the sum of its parts. For literature, that means the prose is best experienced and understood in its entirety. Hamartia: Sorta-kinda like a tragic flaw but more encompassing. It can be poor judgement, bad luck, error, accident,or misinformation that cause a character’s downfall. Hermeneutics: Interpreting sacred texts in a grammatical, ethical, allegorical, or mystical manner. The parts must be studied in concert with the whole, and the interpretation, as well as the interpreter, are also important considerations. Jeremiad: Named for the biblical Jeremiah, it is the dire prophesy of destruction if <<insert evil group here>> continue their wicked ways. Kunstlerroman: Like a bildungsroman, but instead of chronicling a youth’s growing to maturity, the novel focuses on showing an artist’s development. Litotes: Saying the opposite or using an ironic understatement to give impact to one’s statement. Malapropism: A character who substitutes a word ( perhaps unintentionally) for a very similar sounding world. This is done for comedic impact,and a device often employed by Shakespeare. Real life example: A student said he was going to defile me. He meant to say defy. We all had a good laugh and it was a teachable moment. Example from “A Midsummer Night’s Dream” & spoken by Bottom. ‘I will aggravate my voice so’—he probably means moderate; ‘…there we may rehearse most obscenely‘—he means obscurely; and ‘Thisby, the flowers of odious savours sweet’—he means odorous. Nom de plume: Using a pen name, but the French version sounds ever so much more sophisticated Oui? Some authors use different names when they write other genres or to conceal their gender or identity. Or perhaps to appear more mainstream. Pathetic fallacy: Giving human emotions to something in nature. John Ruskin didn’t like the term personification. Peripeteia/ peripety: The sudden change in fortune of the protagonist. Aka, the reversal. See Freytag’s pyramid. Roman a clef: French for ‘novel with a key.’ Real people are disguised in novels with fictitious names. Verisimilitude: Appearance of truth. The most famous might be H.G. Well’s War of the Worlds. I advise NOT using these terms in normal conversation as they tend to give one an air of snobbery. This entry was posted in Reading & Writing and tagged analyzing literature, fiction, literary analysis, literary terms, literature terms, LZMarie, novels, writing, writing blog, writing tips on January 5, 2014 by lzadmin.